Tracy is a paralegal working with each of the attorneys here at Hoffman Koenig Hering. She has considerable experience in the legal and health care fields, having worked as a Chiropractic Assistant for almost 10 years before going back to school to obtain an Associate of Applied Science in Paralegal Studies. Tracy is also a Notary Public. 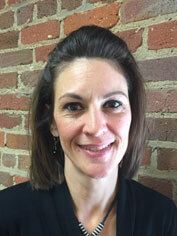 Tracy grew up in Rockingham County and has lived there for most of her life. Her pride and joy is her son, Justin. When Tracy is not working as a paralegal, she helps her fiancé’ Chris, run their interior/exterior custom painting business. To relax and recharge, Tracy and Chris enjoy heading off to Carolina Beach with their two dogs, Marley and Abby.